We’ve often scratched our heads as to why many Republicans — especially the party’s leadership — seem so averse to rail, transit and bike infrastructure. There seems to be a mismatch between the party’s espoused ideals and its preference for highly subsidized and highly expensive auto infrastructure. The Democratic Party holds most of its power in the nation’s cities, whereas the GOP retains greater strength in the exurbs and rural areas. The two parties generally fight it out over the suburbs. 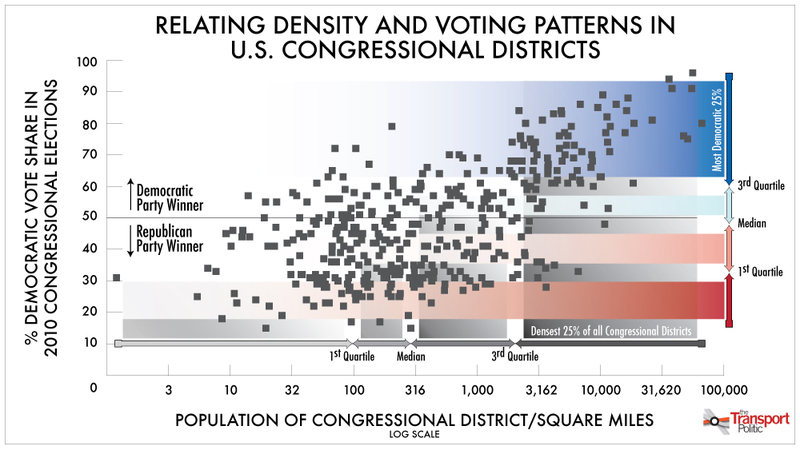 In essence, the base of the two parties is becoming increasingly split in spatial terms: The Democrats’ most vocal constituents live in cities, whereas the Republicans’ power brokers would never agree to what some frame as a nightmare of tenements and light rail. What does this mean? When there is a change in political power in Washington, the differences on transportation policy and other urban issues between the parties reveal themselves as very stark. Republicans in the House of Representatives know that very few of their constituents would benefit directly from increased spending on transit, for instance, so they propose gutting the nation’s commitment to new public transportation lines when they enter office. Starting two years ago, Democrats pushed the opposite agenda, devoting billions to urban-level projects that would have been impossible under the Bush Administration. This situation, of course, should be of significant concern to those who would advocate for better transit. To put matters simply, few House Republicans have any electoral reason to promote such projects, and thus, for the most part they don’t. But that produces a self-reinforcing loop; noting the lack of GOP support for urban needs, city voters push further towards the Democrats. And sensing that the Democratic Party is a collection of urbanites, those from elsewhere push away. It’s hard to know how to reverse this problem. In addition to securing political support for transit investment, a big part of the challenge for transportation reform, without a doubt, is explaining to the representatives of more rural districts how smart growth policies can save taxpayers money and benefit their constituents. We’ll see how President Obama frames the issue in tonight’s State of the Union address. Elsewhere on the Network today: Rebuilding Place in the Urban Space looks at various regionalism efforts nation-wide and wonders why so many states and municipalities are still competing against each other at the expense of the greater good. The Overhead Wire examines all sides of Charlotte, North Carolina’s decision between bus rapid transit, streetcars and high-occupancy vehicle lanes. And The Fast Lane looks at 2010’s winner of the Oberstar Safe Routes to School Award: Utah’s Alpine Elementary. Is Your Rep a Member of the New Public Transportation Caucus Yet?